Successfully Added Solar LED Light String (3.5 Meters) to your Shopping Cart. Solar LED Light String - the perfect eco-friendly lighting gadget for your home or garden. Watch as they come alive with a beautiful blue aura at night! This LED Light String is 3.5 meters long and comes with 40 blue LED lights to decorate whatever you wish and wherever you want. Hang a few around your garden to make those flowers even more beautiful or place them over your front door to give visitors a feeling of mystery and mystique! This LED Light String comes with a built-in rechargeable battery that is automatically recharged by the solar panel. 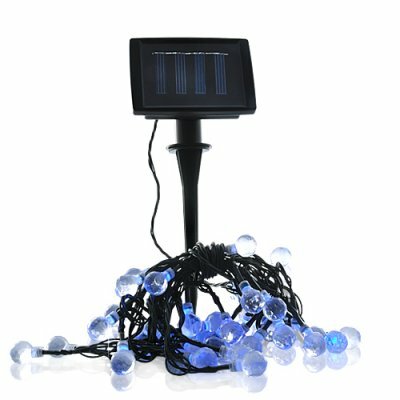 During the day, just leave it outside and let it do its thing, but at night, watch as it comes alive with its mesmerizing blue LED bulbs. Even better, it will last up to 8 hours on a full charge so you don't have to do a thing - just watch as it charges during day and instantly come alive at night! This is the perfect item for decorating your lawn and garden at any time of year. It's stocked in our warehouse right now so order today and we'll ship it out tomorrow. Worldwide shipping to any destination, whether it's you or your customer.